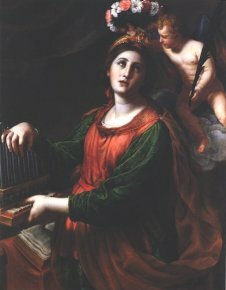 The recent unveiling of the Dulwich Picture Gallery’s newly-restored Saint Cecilia (ill. 1) has aroused much interest because of its uncertain attribution. ‘Dulwich Picture Gallery saves St Cecilia from ruin – but who painted her ? :as the rescued baroque picture goes on display following conservation work, the hunt for the artist begins’ was, for instance, the dramatic headline of Mark Brown’s article in The Guardian (29/12/11). 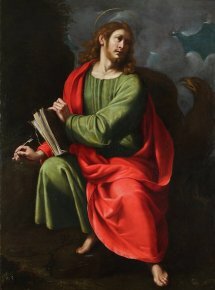 The painting is described, more demurely, in the Gallery’s press release as ‘a fine example of seventeenth-century Baroque Bolognese School painting by an artist in the circle of Carracci’. Attributions to Francesco Guarino  and, in La Tribune de l’Art, to Carlo Bononi (see article) have already been suggested. I would like, however, to suggest another possible artist. The most striking feature of the painting is its rich colour tonalities of green, red, yellow, and purple. 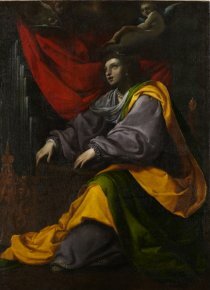 These are all typical of the work of Alessandro Turchi, called l’Orbetto, especially the juxtaposition of red and green, which is a distinctive feature of the late work of this artist. Alessandro Turchi was born in Verona in 1578, and had a complex artistic development, before finally settling in Rome in 1614. His early works echo Veronese and Lombard mannerist traditions whereas his mature style shows the influence of the Bolognese school, in particular Guido Reni and Guercino, and is distinguished by its rich, Veronese-like palette. In Rome, he collaborated with Carlo Saraceni and Giovanni Lanfranco on the decoration of the Sala Regia of the Palazzo del Quirinale, besides receiving commissions for altarpieces and cabinet paintings from, among others, Scipione Borghese, Cassiano dal Pozzo, and the Aldobrandini and Barberini families. His election in 1637 as Principe of the Accademia di S Luca indicates his pre-eminent position in Roman artistic circles. His fame outside Italy can be gauged by the presence of his works in the collections of Cardinal Richelieu and by the commission from Louis Phélypeaux de La Vrillière to supply a painting for the gallery of the Hôtel de la Vrillière, a decorative scheme which also included works by Guido Reni, Guercino, Nicolas Poussin, and Pietro da Cortona . 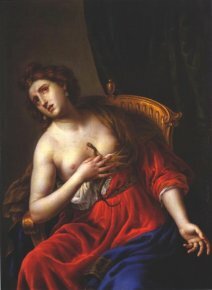 Turchi’s contribution, The Death of Cleopatra (1640) (ill.2), is one of his greatest and best-known works, showing the same rich combination of colours as the Dulwich Saint Cecilia. Moreover, the treatment of the voluminous draperies in the Dulwich picture also points to other late works by Turchi, such as a small Death of Cleopatra another St Cecilia and the recently attributed Saint John the Evangelist. 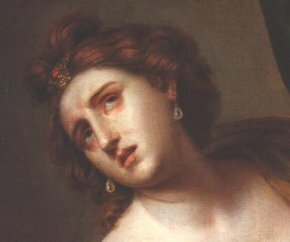 (ill. 3-5) The depiction of eyebrows is also another distinguishing feature as can be seen by comparing the head of Cleopatra (ill. 6) to that of the Dulwich Saint Cecilia. ‘This week’s art diary’, The Guardian, 3 January, 2012. The suggestion was made by John Spike but the Gallery’s response was that it was ‘A good theory… although … the work might not be quite good enough to be a Guarino’. For an account of Turchi’s work in French collections in the 17th century see Nicolette Mandarano, ‘Dipinti di Alessandro Turchi nelle collezioni parigine negli anni Trenta e Quaranta del Seicento.’ In Rome-Paris, 1640, Sous la direction de Marc Bayard, Rome : Académie de France à Rome, 2010. 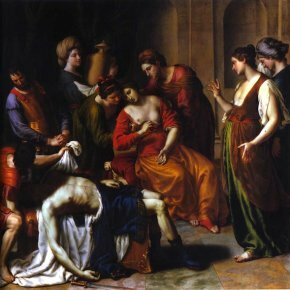 See also : Alessandro Turchi, detto L’Orbetto, 1578-1649, a cura di Daniela Scaglietti Kelescian, Milano, Electa, 1999. Next article in Essays : A Phaethon by Noël Coypel for Monsieur ?